The city of Oakland and high-level backers of building a ballpark at Howard Terminal have taken small but important steps to make that dream a reality. 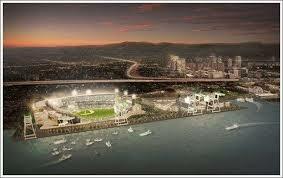 The five-member consortium, which includes Clorox CEO Don Knauss, Doug Boxer and former Dreyer’s Grand Ice Cream CEO T. Gary Rogers … formally asked the Port of Oakland to enter into exclusive negotiations with the goal of developing a ballpark and other amenities at the terminal. The agreement would include an option period of two to three years during which the businessmen would work to obtain the necessary permits and perform an estimated $1 million environmental review of the site. So, what’s next? This Thursday (Feb. 13), the Port of Oakland commissioners will meet and, per the recommendations of the Port staff, may reject all planned maritime uses for Howard Terminal. Why is that important? If all maritime uses are rejected at the meeting and the Port proceeds with the exclusive negotiating agreement with Oakland Waterfront Ballpark LLC, it paves the way for them to plan the next crucial steps for Howard Terminal’s environmental and infrastructure work, including the environmental impact report. Clearly these things take time. But in the fight to keep the A’s, Oakland has time on its side. (And the facts, too.) San Jose’s lawsuit appeal against MLB is at least months — maybe years — from being resolved. Heck, we here at Baseball Oakland even celebrated our 4th year anniversary recently, a time period we did not think would be needed when we formed in late 2009. Please keep in mind: Howard Terminal is no fantasy. It is a very viable A’s ballpark site studied and planned by deep-pocketed Oakland/Bay Area business leaders with a strong track record for putting together big, successful deals. We believe in this plan and its main backers. As with any process, this one may take some time. But once these crucial steps for Howard Terminal are completed, we believe the Oakland waterfront soon will be the home of the Oakland Athletics, transforming the franchise, downtown Oakland and Jack London Square all in one fell swoop. Just a few years ago, Lew Wolff was saying the Coliseum’s age prevented Billy Beane and A’s from attracting free agents or keeping their own. The problem with that is that none of it was true. John Shea’s Chronicle article from the weekend’s A’s FanFest noted that Coco Crisp wants to stay in Oakland; he extended his contract through 2016 (with an option year in 2017). For years, Wolff has tried to paint the Coliseum as a place where the A’s, a) “Couldn’t compete,” and, b) Beane “can’t attract free agents.” But Shea paints a different picture. He reports that players were staying away from the A’s from 2007-2011 because the franchise was saddled with a losing team and a league-wide perception that owners Wolff and John Fisher were not committed to winning. To his credit, Shea also wrote that the state of the aging Coliseum, in fact, has NOTHING to do with whether or not the team attracts or retains free agents. He noted that new A’s closer Jim Johnson said the Coliseum can be used to the A’s advantage. “As an opponent, you hate coming in here. It’s an advantage if you’re the home team,” Johnson said. Shea is right. The Coliseum has nothing to do with signing players. If owners are willing to pay ball players market value on a team that has a decent chance to compete for the postseason, the players will sign anywhere. The truth about the Oakland A’s is that they can sign the free agents they want because players want to play for a two-time divisional winner (as the A’s are), and in front of passionate, loyal fans (as the A’s have in Oakland). And now that the team is managed by the widely respected Bob Melvin, it is exactly the type of franchise that most athletes wish to play for.